…and the Oscar goes to "Florida Cracker" Ace Joseph Forster. Since the return to the Philippines, the U.S. invasion forces have been under constant attack by air. 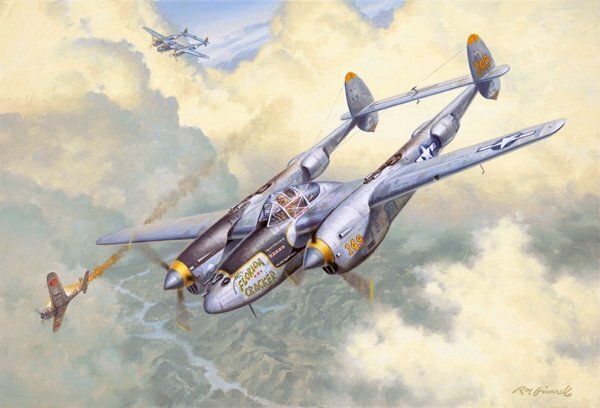 On November 2, 1944, the day Joseph M. Forster makes Ace, he moves with his group, the 475th FG, 432nd FS to Tacloban Airbase, on Leyte Island in the Philippines. On November 8, Forster and his wingman Lt. Walter Freeman were in the air at dawn taking off from a mat strip runway in poor weather with towering clouds that rose from the deck as far as anyone could see. Almost immediately, Lt. Forster notes flak bursts near Dulag. Investigating, he spots a lone Nakajima Ki.43 Oscar and gives chase. Just as the Oscar entered the clouds over the Catmon Mountains, Forster fired deflection shots and scores hits. Following the Oscar into the clouds, he scores additional hits. As he and Lt. Freeman roll out of the cloud base, on each side of the mountain, they observe the Oscar going down, engulfed in flames and watch as the Oscar slams into the jungle. Lt. Forster had just scored victory number 6 in dismal weather conditions! He finishes the war with 9 victories, two more Oscars, three Zekes, two Kawasaki Tony's, and one Mitsubishi twin engine Dinah. Walter is also credited with 3 probables, and 1 damaged.